Bee marked cards with a bee on the back have two color designs, the red deck and blue deck. Some players have reflected that why some playing cards have a good clear effect, some cannot see clearly? The following I will explain this issue for you. Different playing cards have a different effect after being processed. The color of the playing cards is one of the most important factors. The color of the back playing cards decides the marks of the playing cards. 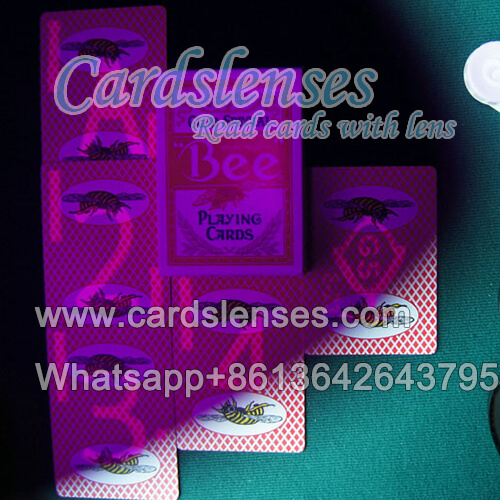 Red back of playing cards is easily to be marked, the effect generally is clear and good. However, for some manufacturers, blue playing cards is big problem, it is difficult to mark it. But for our company, we can mark the blue deck easily with a clear effect. We can mark the Bee playing cards with a bee on the back perfectly, no matter the red deck or the blue deck. For red trick deck, we can choose to mark it with small marks on the four corners, as well as the big middle marks. Because red marked deck is easily to be marked. For the blue trick deck, we usually choose to mark it with a clear big middle mark. So you can according the color of your playing cards to choose the marks when you purchasing marked cards.